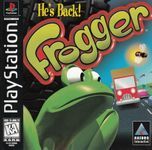 The original Frogger... Revived,Rebuilt, and Ready to Hop! And now he's armed with a heat-seeking tongue, power croak and super jump. Hop to it Frogger!